The Mystery of the Missing $1,200 Per Person: Can Medicare’s Spending Slowdown Continue? This insight updates the original July 2014 version to reflect new budget projections released by the Congressional Budget Office. The big story in the Medicare world these days is the slowdown in program spending. Based on our comparison of CBO’s August 2010 and August 2014 baselines, Medicare spending this year will be about $1,200 lower1 per person than was expected in 2010, soon after passage of the Affordable Care Act (ACA), which included reductions in Medicare payments to plans and providers and introduced delivery system reforms that aimed to improve efficiency and reduce costs. By 2019, Medicare spending per person is projected to be more than $2,400 lower per person than was expected following passage of the ACA. 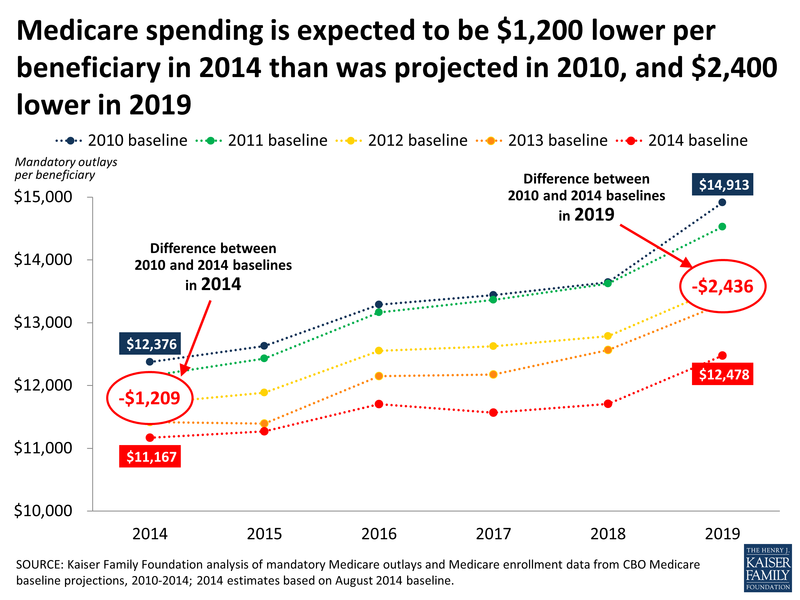 Medicare spending projections in CBO’s August 2010 and subsequent baselines take into account the anticipated effects of the ACA, along with other factors that are expected to affect future Medicare spending. So it seems that the ACA may be having a bigger than expected effect, but something else may be going on here too. The numbers are impressive, and the consecutive year-to-year reductions in projected Medicare spending are unprecedented. Looking back, total and per person Medicare spending have grown more slowly each year since 2010 than was expected based on CBO projections, and on a per person basis, Medicare spending actually declined between 2013 and 2014, according to our analysis of data from CBO. Health care observers are still scratching their heads trying to explain why Medicare spending is growing so slowly. A CBO analysis shows the Great Recession did not have the same effect on Medicare that it had on the slowdown in health care spending generally, which has been documented by our Kaiser colleagues. It is clear that the Medicare savings provisions in the ACA, such as reductions in provider payment updates and Medicare Advantage payments, have played a major role, and the changes included in the law may be having a bigger effect than was expected soon after the law passed. In addition, the Budget Control Act of 2011 also exerted downward pressure on Medicare spending through sequestration that reduced payments to providers and plans by 2 percent beginning in 2013. And yet even after incorporating these scheduled payment reductions in the baseline, CBO has continued to lower its projections of Medicare spending. So what else might be going on here? In addition to scheduled reductions in Medicare’s more formulaic payment rates, providers may be tightening their belts and looking to deliver care more efficiently in response to financial incentives included in the ACA, and it is possible that these changes are having a bigger effect than expected. For example, CMS recently reported that hospital readmission rates dropped by 130,000 between January 2012 and August 2013. It is also possible that hospitals and other providers are using data and other analytic tools more successfully to track utilization and spending and to reduce excess costs. Another more straightforward factor is that several expensive and popular brand-name drugs have gone off patent in recent years, which has helped to keep Medicare drug spending in check. Whatever the causes may be, the slowdown in spending is good news for Medicare, the federal budget and for beneficiaries—at least for now, and as long as it does not adversely affect access to or quality of care. Lower costs lead directly to lower Medicare premiums and cost sharing. Lower costs also help to improve the balance sheet for the Part A Trust Fund. Even with this good news, it is unclear how long slow growth rates can be sustained. The Medicare actuaries expect Medicare spending to begin to rise more rapidly in the coming years due to a number of factors, including faster enrollment growth, an increase in service use, and faster growth in payment rates due to higher prices brought about by a healthier economy, which will not be fully offset by payment reductions included in the ACA. And Medicare continues to face long-term financing challenges brought about in part by an aging baby boom population. These challenges will, no doubt, continue to be the subject of policymakers’ attention. But for now, the slowdown in Medicare expenditures, as illustrated in the unexpected $1,200 per beneficiary reduction in spending this year, may ease short-term budgetary pressures on Medicare and could provide an opportunity for thoughtful consideration of ways to bolster the program for an aging population. The previous version of this insight reported that Medicare spending in 2014 will be about $1,000 lower per person than was expected in 2010, based on data from CBO’s April 2014 baseline of mandatory outlays estimated at $612 billion. This revision reflects CBO's August baseline of $603 billion ($9 billion less), producing a lower estimate of per capita spending. Health Cost Growth Is Down, Or Not. It Depends Who You Ask.